As we have written, seemingly ad infinitum over the past month or so, next week’s #PTELondon has gathered a lot of interest in the AV community, and we have already listed those that we know in our world who are exhibiting and speaking. The latest to issue a press release on their taking part is AV technology pioneer Peerless-AV, who will be exhibiting on stand 1132. They will be showing a 55” Xtreme™ High Bright Outdoor Display water tank demo alongside a range of indoor and outdoor kiosks for flight information, check in, retail advertising, wayfinding and more. Visitors to the Peerless-AV stand will witness the weatherproof capabilities of the Xtreme High Bright Outdoor Display as it is sprayed with water to simulate its resistance to harsh environmental conditions. An ideal digital signage and wayfinding solution for outside passenger terminals, the Xtreme display is truly sunlight readable, offering 2500 nits of brightness and outstanding video quality. Fully sealed, without the need for exhaust vents or additional HVAC equipment, the Xtreme operates from -35°C to 60°C, is IP68 rated against the ingress of moisture and dust, and features IK10 rated impact resistant safety glass. The new Outdoor Smart City Kiosk, featuring an Xtreme High Bright Outdoor Display, will also be on the stand. A modern and practical digital signage solution, the Kiosk is designed for 24/7 unattended operation and can withstand winds up to 140mph. Alongside, there will be an EV Charging Kiosk with back-to-back Xtreme Outdoor displays demonstrating the potential for revenue generating advertising in high traffic passenger terminal locations such as car parks. 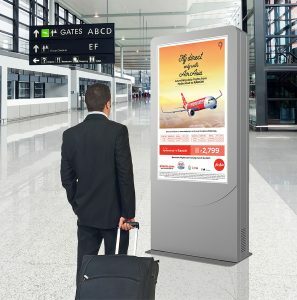 For indoor information, advertising and wayfinding applications, Peerless-AV will show a Universal Indoor Floor Standing Portrait Kiosk with wheeled base for easy transportation between locations, an Indoor Floor Standing Landscape Kiosk with interactive touch display and a stylish Landscape Kiosk designed to accommodate small touch screen displays for check in and digital merchandising. Passenger Terminal EXPO , the world’s leading international airport conference and exhibition, now in its 25th year, takes place in London next, between March 26-28, 2019 and once again it will provide the most significant opportunity for airports and airlines to debate current issues and form business relationships on a global scale, with 7,350+ people from at least 100+ countries attending each year.